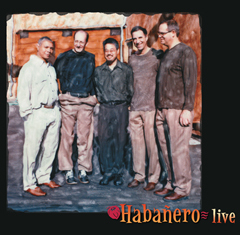 Enjoy a hot live recording from Habañero, saluting son Cubano, the rhythmic pulse of Latin jazz and salsa. Habañero is led by guitarist and tres player Doug Pauly and vibraphonist Rob Lautz backed by the crack rhythm team of bassist Kerry Kashiwagi, drummer Brian Kendrick and percussionist Kamau Mensah. Recorded live at the Stockton Arts Commission Jazz Series at the Oak Park Center, Stockton, CA on October 11, 2003.